Last week’s wind really dried the landscape. It was as if the strong winds blowing in from the centre of this hot continent stole every drop of moisture from the soil surface on the farm and then just took all of that moisture somewhere else. On the other hand that lack of moisture made the construction of the new chicken house and enclosure a bit easier than it otherwise would have been during the depths of winter. 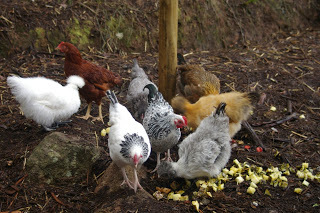 The chicken house and run project – let’s call it “chooktopia” – has received several days of work this week. The chooktopia structure is quite complex because the entire structure is actually two very different sheds under the same roof line. And as if that wasn’t hard enough, I’m trying to foil the activities of the very naughty and intelligent rats, which currently enjoy free access to the existing chicken house and enclosure. Every night those rats are thumbing their twitchy little noses at me and making off with the chicken feed. It is mildly irritating to be outsmarted by a rat, but then I guess that is what is meant when people speak of “rat cunning”. Anyway I must confess that way back in very early 2011, and despite having read many books on keeping chickens, I had absolutely no idea about either chickens or rats. Four years on, I’ve wised up on the subject of keeping chickens and also keeping rats. The new chooktopia project incorporates everything I’ve learned about both of those species since the innocent, heady, early days. 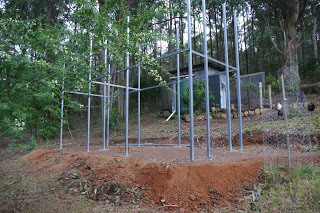 The basic galvanised steel frame of chooktopia was constructed this week. It is very exciting to see all of the steel posts in the ground and the whole steel frame tied together. I thought that it might be useful to look at how I actually construct these structures. If anyone has any questions, please don’t hesitate to ask. Firstly, some people may wonder why I have even chosen to use galvanised steel for the frame and cladding and that is a fair question. The simple answer to that question is that the rats will have quite a bit of trouble climbing up smooth vertical galvanised steel surfaces. Take that you rats! Rats can actually climb vertical timber surfaces with ease. Around here the rats live in burrows dug into the soil or alternatively in hollows high up on very large trees. 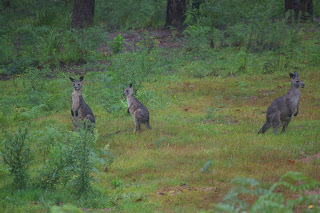 The average family of rats in the forest here will displace sugar gliders, bats and birds. 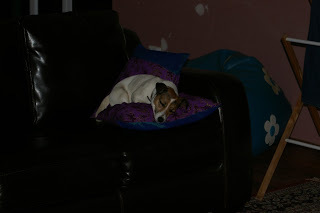 On the other hand, the rats don’t get an entirely easy time of it as they are easy prey for birds, foxes, cats or dogs. Also, the average rat can chew holes into timber and scratch away at any weak edge on a concrete slab. It is a fair thing to say that easy access to chicken feed and scraps is on the average rat’s mind 24/7/365 (take that Kanye!). However, I am yet to see a rat that can chew its way through steel, so the main construction material for chooktopia is steel. The design for Chooktopia incorporates 12 galvanised steel posts and this week was spent installing the remainder of those steel posts. The steel posts are set in structural grade cement in holes which vary from between 600mm (2 foot) to 900mm (3 foot) deep. 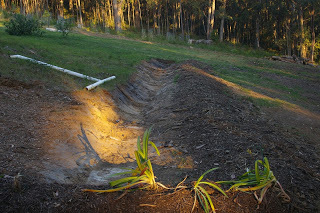 The deeper holes are on the downhill side of the chooktopia project. As a side note, the editor determines the location of the holes via a combination of string lines and tape measures – I do the digging! My understanding on such matters is that to ensure that the structure is an exact rectangle; the editor divides the design of the building into two opposing triangles and simply ensures that the longest diagonal side of each opposing triangle has the same measurement. The electric jack hammer (powered off the solar system) is then used to break up the very hard concrete like clay into small chunks. All of those small clay chunks are then removed by hand from the hole and a nice, neat and clean hole is left for the post to be cemented into. If the clay is less concrete like, I have a one foot wide hand auger which digs a very neat hole and also lifts the clay out in the same digging process. The hand auger just does not work when the clay is as hard as concrete. Soil geek alert! 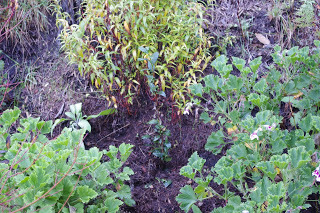 On parts of the farm where compost or mulch has been added (even in small quantities) or a few years of chopping and dropping of the vegetation has taken place (via mowing), the soil is very easy to dig and plants grow in profusion. By the end of the second day of work, all 12 steel posts were cemented into the ground. Observant readers will note the use of the string line and the very bright yellow post and pipe level which are both used in conjunction to obtain perfectly vertical and aligned posts. 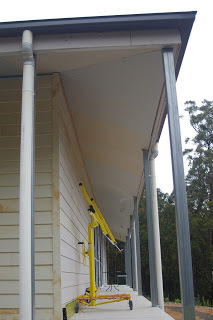 The two doors which were obtained from the nearby tip shop are yet to be installed into the chooktopia structure, but were on hand to ensure that they easily fit the cavities left for them. During winter, because of the cold weather, the cement for the steel posts takes about a day to set. As a comparison, over summer that setting time for cement is about 2 hours. So, I had to wait until the following day to tie the entire structure together and set the roof height, using steel sections. The fancy descriptive for the steel sections is RHS which is an acronym for Rectangular Hollow Sections which is basically a rectangular steel tube. 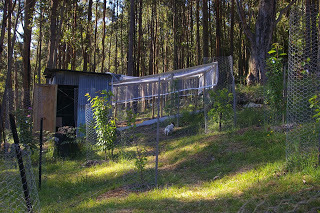 In the photo you can see the chickens observing the new structure from afar under the shelter of a very massive tree. 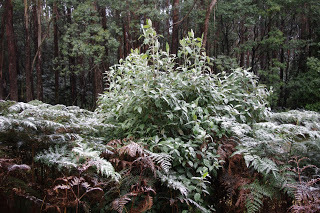 In the foreground is one of the many Tree Lucerne (Tagasaste) shrubs which make excellent chicken feed and are currently in flower. The Tagasaste seeds from the many trees here which were placed in the nursery garden bed have just recently sprouted from the soil. It is a smart tree that decides to get established here before the summer! The recently built firewood shed wasn’t forgotten about as this week either as I installed internal and external 12V LED lights. It is nice to see what you are doing after the sun has set for the day! Was that lump a huntsman spider? April 2011 was like any normal April here. The weather was starting to turn cooler and the days were shorter in length. It is unwise to paint when temperatures are less than 10’C (50‘F) as the paint may not cure properly. Keeping in mind that winter was just around the corner, I painted and joined the entire outside of the house with three solid coats of paint before it got too cold. Most of the exterior surfaces were easy to reach so whilst it was a big job, it got done quickly. The local earthmoving dude brought up 50 tonnes of rock toppings (the white ones with lime) from the nearby quarry. Those rock toppings were spread around the entire house and driveway and serve the purpose of providing an all-weather outdoor surface which just also happens to be non-combustible and acts as a fire break. 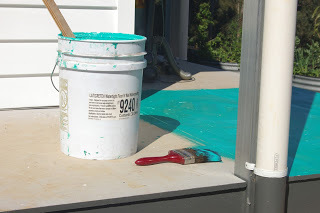 Even more painting occurred that month as a very kind person that I work for donated some water proofing agent for the veranda deck and given there was still a bit of warm sun in the sky before winter set in, I painted that bright cyan product onto the veranda deck. A lovely neighbour donated hundreds of agapanthus plants which I used to line the driveways and access roads here. The ultra-reliable blue and white agapanthus flowers are plentiful every summer despite the scorching heat and are a favourite of the bees and honey eater birds. 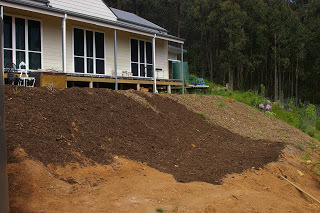 The earthmoving dude also extended the swale which collects any overflow of rainfall from the house water system and I started mulching and planting out the swale earthen embankment. With the days getting shorter in length, I noticed that the 8 original solar PV panels weren’t quite generating enough energy on average to make it through the days energy requirements. With a little bit of mathematical projection, I could see that more PV panels were required and so I installed a further 2 panels. I said at the time to the editor: “Two extra panels should just about do it” – Ahh, such innocent days of yore! As an amusing postscript it is worth noting that there are now 23 solar PV panels installed!After a a few more panels were later installed I admitted my complete ignorance on the matter. Oh yeah, I’d forgotten about this next bit. Having read many books on keeping chickens, I was something of a purist and so happened to purchase a rooster thinking that this would make for a happy chicken experience. Anyway, after a bit of observation time, I named the rooster “Brian” after the brother of Jeff Lindsay’s gripping book (and television) character Dexter. 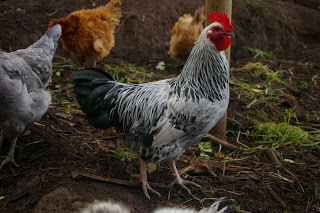 Brian, like his namesake had to go, as he was a vicious rooster who killed a couple of the smaller hens and had the absolute temerity to attack even me. I was outraged by his behaviour and dealt with it by waking up early one night and sorting him out with a very heavy Gurkha knife. After that, peace and tranquility descended quickly into the chicken collective – I certainly felt better and Rumpole became the new boss chicken / benevolent dictator. The temperature outside here at about 9.30pm is 5.0’C degrees Celsius (41’F). So far this year there has been 376.6mm (14.8 inches) of rainfall which is up from last week’s total of 371.6mm (14.6 inches). Street art and organic agriculture have alot in common because they are both considered (by some people) to be outside the “system”. That is an unfortunate viewpoint because organic agricultural methods have so much to offer as they are generally great for the environment because they build both top soil and diversity within a location. On the other hand, street art can sometimes be confronting and often indecipherable, but it also expresses a viewpoint from the socially and economically ignored and it can give them an outlet. For as long as I can remember, Melbourne has had a culture of street art, protest slogans and generally anti-establishment political commentary displayed across any and all available wall spaces. When I was a child, I remember regularly travelling on the train system from one destination to another, and that travel was enlivened because I was exposed to a world of political and social commentary scrawled in paint along the back fences (generally constructed of corrugated iron. 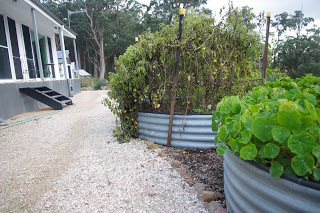 Mmm corrugated iron sheeting – so useful) of some of the inner city houses which abutted the train lines. Some of the political and social commentary was even quite amusing! One example I remember reading, had a map of Australia with the words “Redneck Wonderland” scrawled underneath it and the graffiti inspired the band Midnight Oil to pen a song with the same name. It was very weird because no one ever used that derogatory term here. Anyway, there was a less serious side to graffiti too. When I was a teenager I’d see that people would draw a love heart on a wall and in the middle of that stylised heart scrawl something along the lines of “Kevin 4 Eva”. It was very common. I did realise at the time that by using the word Eva, the writer had meant to use the word “Ever”, but it always used to amuse me thinking that this Eva sure was a popular girl. The fact that I’d never actually met a girl called Eva didn’t really decrease my amusement! 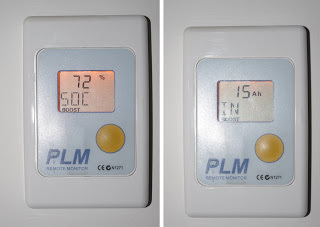 The system itself uses 0.5kWh every day simply to operate. About six months ago, a meeting was held in the nearby township promoting solar electricity generation and a few people independently approached me and suggested that I speak at that particular meeting. In every instance I declined because I realised that my experiences with solar electricity production didn’t match their expectations and whilst I enjoy public speaking, I didn’t want to be the one to have to point that dissonance out. From my perspective, people that spruik a potential solar electricity future are akin to gamblers as they talk up the sunny days and somehow gloss over the cloudy ones. At the end of the fourth day of solid fog as the dusk settled and the sun (what sun?) disappeared over the horizon, the skies suddenly cleared. It was very cold as it was just above freezing that night, and the stars glowed overhead in their full crispy glory and the milky way could be seen as a streak of milky white light across the sky. Stepping outside into that night time, I wondered whether I would see a shooting star fall and then, bang, almost as if on demand one fell and it made me start slightly. The next morning, a frost had settled on the ground. 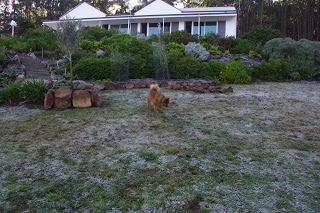 Poopy the Pomeranian, who with his thick double winter coat, would be expected to be able to cope with such things in his stride was gingerly walking around the herbage below the house and sort of asking me: What is this frozen stuff boss? The light frost was a bit of a concern, but fortunately all of the plants struggled through unharmed, including the tea camellia which I seem to have managed to have planted in the one protected and frost free spot on the farm. Then just to confuse me further the weather warmed up and produced a glorious sunny and warm winter day. 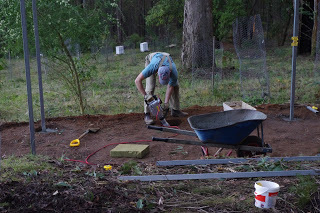 That time was used to excavate – by hand – a flat site for the new chicken house and enclosure project. 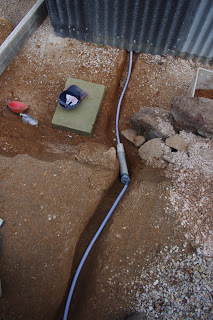 The site excavations were completed and a couple of steel corner posts were cemented into the ground. It was beautiful, warm and still, a perfect winter’s day. 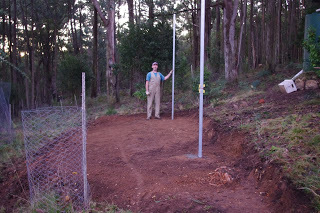 I was hoping to get a couple of extra posts in the ground over the next day, but later that night the wind picked up. And the wind gusts became stronger, and then just for good measure they became even stronger again. The farm is not perched in a windy part of the world, but occasionally when the wind does decide to blow, it blows very strongly indeed. It is not a smart idea to be working underneath very large trees on a windy day, because if a tree falls over or the head of a tree falls off, either one of those can kill you, so the construction came to a complete halt today. In case you remain unconvinced, this massive tree which I reckon is over 30 times my height fell over today with a resounding thud! The wind is howling still as I write this and it is expected to continue howling again tomorrow. 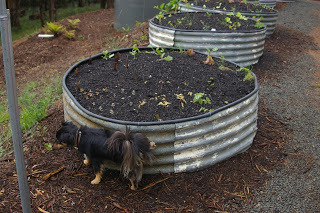 The remains of the steel water tank that was a featured in last week’s blog via a donation to the household from a kindly neighbour was converted into a couple of new raised garden beds. 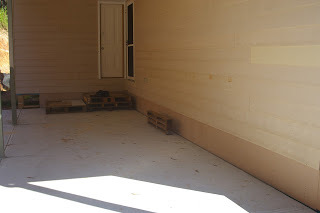 The firewalls which surround the underneath of the house were slowly constructed and a concrete slab in an outdoor under cover area was also constructed during February 2010. The chicken house and enclosure was stocked with happy birds from a local supplier and it is notable that four of the birds in the photo below are still enjoying the chooktopia today! 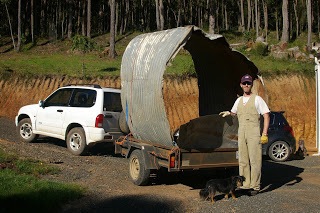 During that month I also manage to scrounge some additional steel raised garden beds, although I was now travelling much further afield to acquire the damaged steel water tanks as they were getting rarer locally. 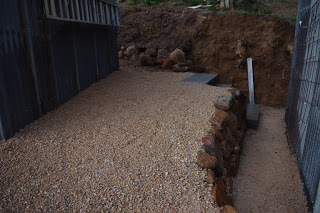 The council had required me to install a culvert, which is basically a very large and expensive concrete 300mm (1 foot) drain under the driveway which collects all of the rain water which runs off and along the roadway. That culvert then just happens to also deposit that rain water into a swale which fortunately happens to be at the top of the shady orchard. 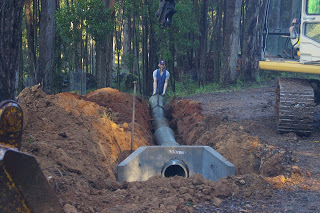 It is a big pipe and sometimes, the house wombat will use the pipe as a super highway when travelling from one side of the driveway to the other! The building surveyor took issue with the excavations which he considered to be too close to the rear of the house. This was also despite the fact that many sites in the area showed signs of stability with earthworks for over a century or more. 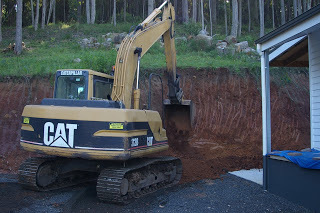 Anyway, the local earth moving guy made short work of that job. The tea camellia now lives in that sheltered area protected from the winds and frost by the house. It is crazy windy outside the house here and the temperature outside here at about 8.30pm is 6.1’C degrees Celsius (43’F). So far this year there has been 371.6mm (14.6 inches) of rainfall which is up from last week’s total of 348.8mm (13.7 inches). Plenty of chainsaw action took place this week. I’ve now finally completed the penance for my error which was detailed in last week’s blog that resulted in me getting ripped off. It is nice to finish a big task like that one, but a weekly blog about chainsaw activities is possibly not that interesting and may even be considered to be a little bit dull. So, let’s forget about the many hours of chainsaw activities that occurred and instead discuss the other more interesting things going on here. A couple of months back I had serious concerns that I’d arrived at “peak rocks”. Peak rocks, is the time at which all of the easy to recover rocks on the farm were utilised in rock walls. Such an event would be very disturbing because it may require having to bring rocks in from outside the farm. The thought truly strikes fear into my heart because that also may mean actually paying for rocks when I’d been previously obtaining them for free! Fortunately, after a bit of exploration deep into the forested lands on the farm I’ve discovered quite a few very rich veins of rocks. 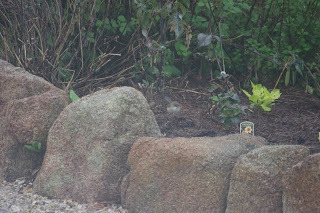 Those rocks are there for the taking and I’ve been busily making plans for all of the projects that they can be used in. However, there is one minor catch. All of those rich veins of rocks are downhill of the house, so if I want to use the rocks, I have to bring them back up the hill. If it was summer, I’d simply drive the trusty white Suzuki down the hill to the nearest accessible place, load the vehicle up with rocks, and then drive it back up the hill. Easy! However, it is now winter and whilst the trusty white Suzuki will happily undertake the downward journey, coming back up the hill presents a few difficulties because the vehicle will do a whole lot of damage to all of the carefully maintained herbage which the local animals eat. And it would not look good at all not being able to make it back up the hill. Plus, how would I be able to get to the Post Office / Cafe. Rocks are still being recovered, but I’m now having to go “old school” which means simply loading those rocks onto a wheelbarrow and pulling them up the hill by myself. It is a slow but sure process at this time of year. 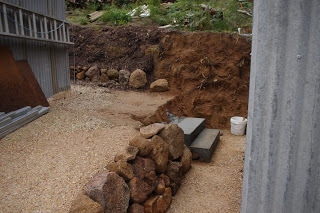 With the benefit of a supply of additional rocks, the retaining wall around the new firewood shed has now been completed. 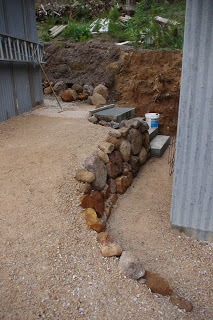 The photo below shows the retaining wall with its various components. 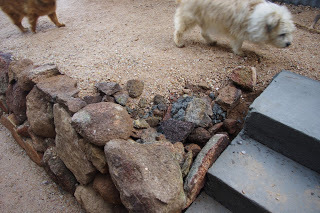 Behind the very large rocks which form the face of the face of the retaining wall are many smaller rocks. Those many smaller rocks are mixed in with the local clay to ensure that the much larger rocks on the outward face stay more or less as they were laid. Over the top of all of those rocks a layer of rock toppings from a local quarry is added. 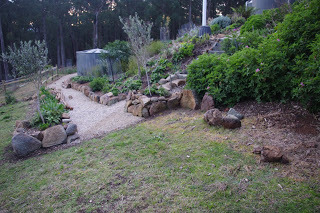 Those rock toppings contain lime which when combined with water and rainfall forms a more or less solid surface. Rock wall action continued, because this week I scored two new olive trees. I use both the olive fruit and the oil from the pressed fruit all of the time in cooking, so more olive trees are very exciting. It is amazing how much fruit an advanced olive tree can produce and the trees just thrive here. There are now about 15 olive trees in the orchard and whilst I’m not in danger of running out of space for more fruit trees, I did have to work out exactly where to plant the two new olive trees. I was never really sure what to do in that garden area anyway and because of that I’d done nothing. 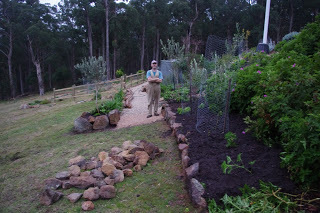 However today, that rock wall was extended a further 5 metres (16.5 feet) and the two olive trees were planted into the new garden beds. 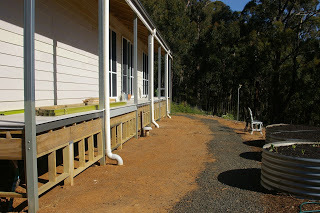 The photo below shows how these garden beds are constructed. 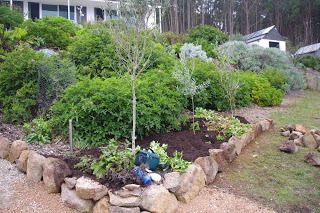 The two new olive trees were planted and some of the soil was enriched with plant cuttings. At this time of year some plants can be cut back very hard and I use those cuttings as fill for new garden beds. On top of the cuttings, I add a thick layer of mushroom compost. Soil geek alert! The worms and all of the other soil life happily turn those cuttings into a rich and healthy soil. Observant readers will note that although it is winter here, I’m standing outside in a t-shirt because the weather has been extremely warm this week. It almost felt as though spring had arrived early and many of the bulbs actually started to produce green shoots. Very observant readers will note that just behind where I’m standing in the photo there are many piles of saplings which will be used as pickets on the berry enclosure just behind me and to the left. 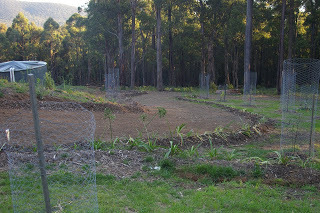 The cycles of nature dictate what has to be done when here and planting out all of the berries into that berry enclosure has to be completed before the end of August. That unfortunately means getting the pickets onto the berry enclosure before that date. 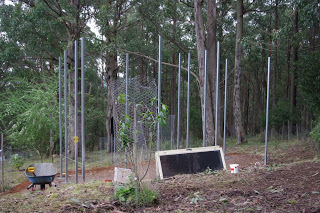 If those pickets aren’t installed around the berry enclosure I might as well just feed all of the berry plants to the wallabies who will happily eat every one of them! 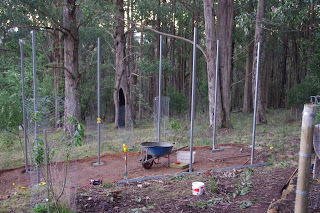 The pickets will be simply screwed onto the fence rails surrounding the enclosure. The only problem with that plan is that the 20 year old trusty yellow drill has required a few repairs. 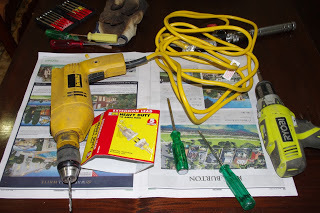 A few months back I added a brand new keyless chuck to that trusty yellow drill, but with all of the bashing around during the construction of the machinery and firewood sheds, the electrical cord broke somewhere and the drill stopped working. Perhaps it wasn’t a good idea to hang the drill from the steel roof joists by its electrical cord? Anyway, this week I performed a hack on a new heavy duty extension cord and rewired the trusty yellow drill and all was good. I didn’t actually go out of my way to colour match the electrical cable to the drill, but sometimes – what can I say – magic happens! In breaking egg news, as the winter solstice is fast approaching the chickens decided this week to up their egg production and I’m now retrieving about three eggs per day from fifteen chickens. 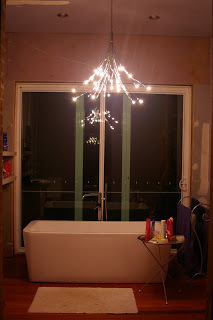 As the 2010 year ticked over into January 2011, I was busily installing architraves, door jambs and internal doors. The door to the left in the photo below was very important because it was for the visitor’s toilet! 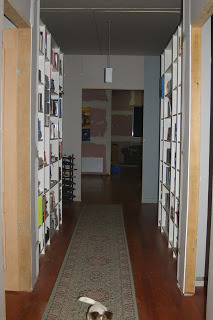 During that time, I somehow managed to fill the book shelves that line the hallway too. 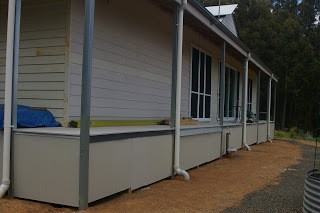 As it was summer, the 90 minute fire rated walls which protect and surround the underside of the verandah deck were installed. 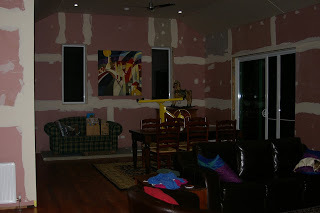 The photo below shows the first layer of 16mm (0.63 inch) thick fire retardant and moisture resistant plaster installed over a treated timber framework. 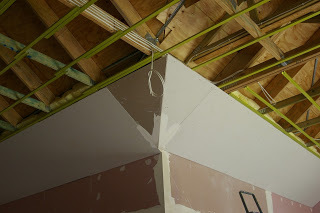 The top edge of that plaster is further protected from moisture by various steel flashings that I had on hand. Those steel flashings weren’t necessary and may have been a bit of overkill, but it provides an additional long term moisture protection to the plaster. Those same fire rated walls protect the timber which holds up the veranda roof too! The join in the corner of the veranda was a nightmare angle, but fortunately the editor has a better brain for such things than I. 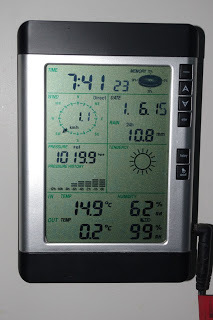 The temperature outside here at about 9.00pm is 7.8 degrees Celsius (46’F). So far this year there has been 348.8mm (13.7 inches) of rainfall which is up from last week’s total of 339.4mm (13.4 inches). Beginning from the gold rush era of the 1850’s, for about a century the forests in this mountain range and the surrounding areas have been logged. Large scale wild fires have also left their mark on the forests, with the most recent big one occurring in the summer of 1983 (Ash Wednesday fires). You don’t have to go far to see the impacts of either. Sometimes it may be a broken thick rusty old steel cable abandoned in an unlikely area that hasn’t seen a person for decades. 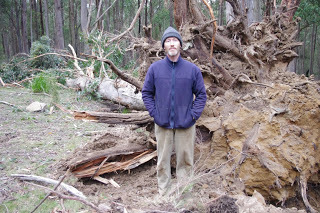 Other times it could be burnt trees or stumps lying down on the ground with their charcoal exteriors protecting the timber and the insides of that tree are as pristine as the day it succumbed to the wild fire. 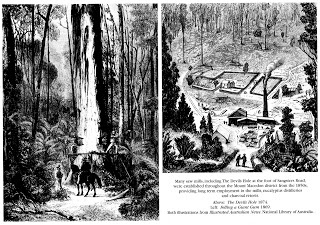 One of the earliest European explorers, Major Thomas Mitchell, who was the Surveyor General of NSW and who crossed this mountain range in 1836 wrote at that time: “left dense timber on colder south slopes but north slopes were open enough to ride horses up. 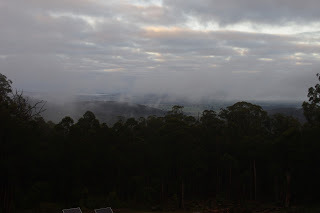 Mitchell continued south east to Mt Macedon, crossing from granite to basalt. The forest was denser, but again north slopes were more open than south, and both were more open … South of the mount … found both thick forest and downs of park-like scenery”. Today it would be impossible to ride a horse up one of the north slopes as the forest is very dense. The forest on the south slopes is even thicker again. Clearly the Aboriginals were also modifying the forest long before the Europeans even thought about venturing to this far country. These days there is no requirement at all for land owners to actively manage the forest in and around their properties. In fact, some people view the forests here as some sort of untouched wilderness which should be be left alone by humans, despite evidence to the contrary. Deep down though, I suspect that people want to avoid the inevitable hard work and cost that active management of the forests involves. The Aboriginals used to burn off between 30 and 40 hectares (70 and 100 acres) at a time on a rotational basis which allowed animals to move to unaffected areas while the burned areas regenerated. Nowadays in our advanced wisdom the state government tends to burn off between 3,000 and 4,000 hectares (7,000 and 10,000 acres) at any one time. Those large scale burn offs are much better than doing nothing, but it gives the animals that live in that burn off area little chance to move to neighbouring bush because that has also been burnt in the process. The whole process is expensive and hard work so usually only the bare minimum ever gets done. And it isn’t anywhere near enough because wildfires have occured on an alarmingly regular basis throughout the European history of this continent. I’m realistic about the risk that arsonists present each summer and that motivates me to manage the surrounding forest with that risk in mind. 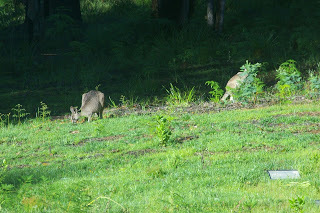 Another benefit of managing the forest is that the local wildlife has a greater supply of food. Therefore, at least once every year I employ a gang of burly blokes to help with the assorted jobs required in maintaining the surrounding forest. It is a good arrangement and I’ve known these guys for many years. They have been very reliable and responsible. So it came as a complete surprise a couple of weeks ago when they finished 90% of the current job and didn’t come back to finish the work as they promised. Unfortunately I had paid them in advance. The penance for my error of paying them in advance has been that I have had to trudge off and finish the work that they were meant to do. Ripped off! That penance has also slowed down work on all of the other projects about the farm. Olives are a bountiful crop and there are two very well established olive trees (as well as many other much younger olive trees) which produce great quantities of fruit. 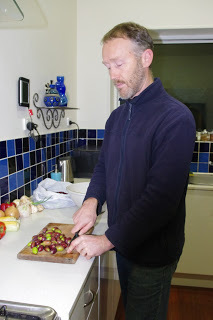 Olives are inedible when they are plucked straight from the tree and they require a bit of processing in brine (a fancy name for salty water). Home processed olives are awesome tasting! Having eaten all of our home grown and processed olives, when I was at the market on Friday, I spotted boxes of the unprocessed olive fruit. I purchased a box and have been busily processing them at night time. 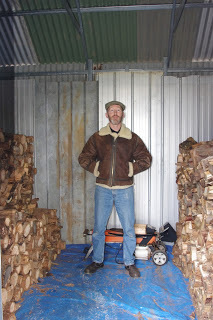 The warmer weather this week provided an opportunity to put more firewood into the new firewood shed. It is a real pleasure over a cold winter to see dry aged firewood available for immediate use! The new concrete stairs had another two further steps constructed. The rock wall has also been extended right up to the concrete staircase itself. The tomatoes are now at the end of their productive life and I’ll probably remove the plants over the next week or so. All of the ripe and unripe tomato fruit will brought into the house. Even the green tomatoes will happily ripen in the warmth inside the house and I’ll be eating fresh local tomatoes for many weeks to come. 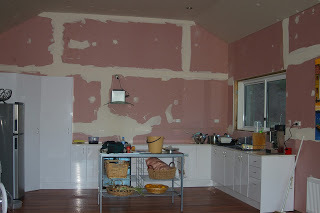 December 2010 was a month of plaster. 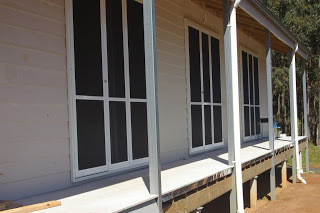 All of the plaster sheets which cover the internal walls of the entire house were joined together. It was a big job, but like the story of the tortoise and the hare, I was the tortoise and bit by bit it was slowly done. The fire rated wall which encloses the underneath of the house was also constructed that month. Very observant readers will note that the first of many raised garden beds were installed. I’m not sure that I can see any tomatoes in them though! About a week prior to New Year’s Eve, the local chook lady said that the chickens I’d had on order would be ready to pick up in a few days. Panic set in and I hastily constructed the chicken enclosure. A wise person once said, act in haste and repent at leisure. That is a true statement relating to the chicken enclosure as I constructed the entire enclosure uphill of the pen which is basically upside down. Still, at the time I knew absolutely nothing at all about chickens so anything was actually possible and it certainly didn’t end up as badly as it could otherwise have been. The herbage above the worm farm sewage system started growing very well that month and the local wildlife finally discovered the joys of manure fed ground covers! The temperature outside here at about 6.30pm is 10.7 degrees Celsius (50’F). So far this year there has been 339.4mm (13.4 inches) of rainfall which is up from last week’s total of 331.4mm (13.0 inches). Today is the official first day of winter and the weather lived up to all of those expectations by providing a light dusting of snow high up on the main ridge above the farm. Snow is such a novelty here that it is a real pleasure to see. However, it was a day for both the sheepskin jacket and the sheepskin lined ugg boots because the outside temperature started at just above freezing (0.2’C or 32.4’F) this morning and didn’t rise much past that figure for the rest of the day. Brrr! 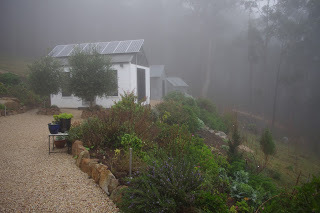 The inside temperature of 14.9’C (58.8’F) this morning was quite reasonable given that the wood heater had been filled with firewood before bedtime and had just slowly burned itself out over the night. I guess that in some northern climates, that temperature would be shorts and t-shirt weather! 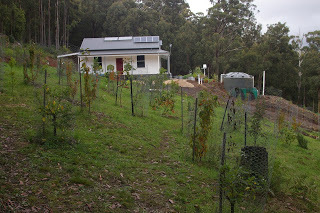 Over the past few days I commenced landscaping the area behind the new firewood shed. It is an interesting project because new opportunities have presented themselves. 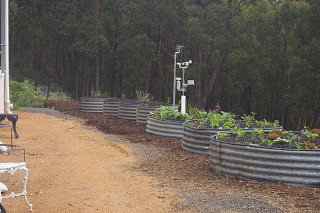 For example over the next few months a dedicated strawberry and tomato area will be established in the very sunny area just up above the machinery and firewood sheds. Sometimes here a project commences and it just takes on a life of its own and new possibilities emerge from that blank canvas. So, despite the rain and snow, I managed to construct two new concrete steps which will eventually form a staircase leading up to that area above the sheds which will provide new opportunities for new multiple dedicated food gardens. However, before I could commence construction of the new concrete staircase, I had to run a power cable to the new firewood shed. The 12V power cable is intended to take power to a water pump and lights for the inside of the shed. All of the power cables (and even the water pipes) are buried in deep trenches so that they are not at risk of being accidentally damaged. Flexible plastic conduit also helps reduce damage to the electrical cables and it is worth noting that I haven’t had any failures with that arrangement. Observant readers will note that where the cable goes behind the rock wall, the cable and plastic conduit is further covered by a plastic plumbing pipe to prevent any possible damage from the rock wall. The funny thing about infrastructure is that once it is in place, new possibilities open up. 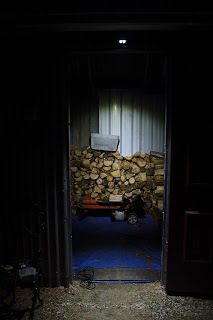 And that was the case this week as now that there was electricity in the new firewood shed, a wholly new idea popped into my head. Aesthetics are integrated into the functional infrastructure here, but sometimes I just do things because I believe that they’ll look good and they may serve no other purpose than that. 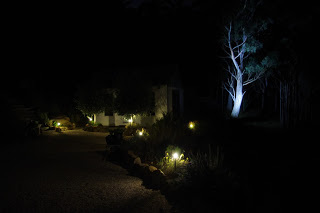 My idea this week was to install a couple of LED spotlights on the new firewood shed which up-light the very large tree close by. The LED lights are set to switch on between 6.30pm and 8.00pm and I reckon it looks pretty cool at night. Certainly, the new ghost tree will freak out the neighbours! 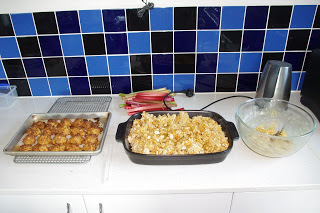 Towards the end of the week, the dogs started complaining about the home made dog biscuits, version one. ‘We don’t like them because there is too much pumpkin in them, they’re not crunchy enough and the old dog biscuits were just better’, so they complained. With the recent rain, the kookaburra birds are also enjoying the easy access to worms and other grubs at the farm here. 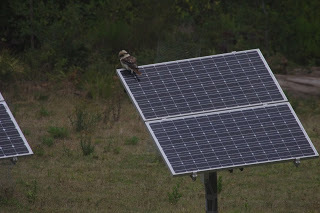 I captured the photo below of a kookaburra today using one of the free standing solar panels as an observation spot for such activities. It is a pity that the bird also regularly goes to the toilet on the solar panel and even that small an offence really impacts the electrical output of the solar panel! The winter solstice for this year is on Monday the 22nd June which is in exactly three weeks today. Most people at this time of year worry about the cold weather. I however, worry about how low the sun is in the sky for the next six weeks. 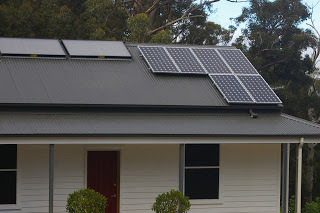 The reason for that worry is because the house is not connected to the electrical grid and is powered solely by solar photovoltaic panels which perform the very nifty trick of converting sunlight into electricity. If the sun is low in the sky though, those 4.2kW of solar panels receive far less sunlight than they would at other more sunnier times of the year. Add in some heavy winter cloud, reliable winter rainfall and solar electricity starts looking like a very unattractive option for heavy users of electricity. Add in a bit of bird manure on the panels and it can be a very nerve wracking few weeks. In the lead up to the summer of 2010, the manufacturer installed the stainless steel shutters which can cover all of the toughened and double glazed windows in the event of either a fire or a big storm. I have a love-hate relationship with those window shutters because they are really functional but it took me a long while to get used to the appearance of them, but they just work so well. 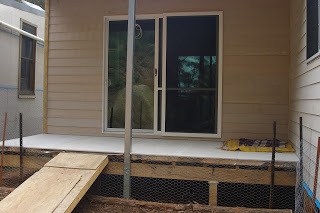 The previous boss dog at that time was getting on in years and could no longer manage a staircase, so I built her a temporary ramp for her to walk up and onto the veranda. 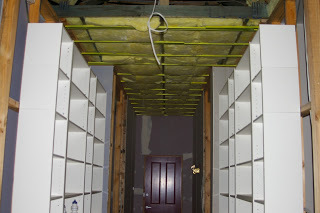 The ceiling plastering continued and two of the corners were an absolute nightmare to construct. Fortunately the editor came to the rescue and assisted with both the carpentry and plastering of two very unusual angles. Additional ceiling insulation batts were possibly a bit of overkill, but I chose to install an additional layer of insulation batts directly on top of all of the ceiling plaster and it was worth every cent! That year of construction was historically the wettest in recorded history. Every time the skies opened, the surrounds of the house turned to mud. Needless to say, I got sick of that problem pretty quickly and started laying down composted woody mulch over all of the exposed clay so that the soil held together better. And then one day the old boss dog had a seizure and died. It was a sad day as she was an exceptionally talented and gifted boss dog. Scritchy, the current boss dog answered the situation vacant advertisement and slid on in. The temperature outside here at about 9.00pm is 2.7 degrees Celsius (36.9’F). So far this year there has been 331.4mm (13.0 inches) of rainfall which is up from last week’s total of 310.6mm (12.2 inches).